Update: Huge thanks to Adam for sharing this post on Twitter! Those of you who know me personally know I’ve been a big fan of Adam Carolla (and his broadcast buddy Dr. Drew) since the early Loveline days when I’d tune in on the hour drive back from tech school or work every night. So when my wife texted after her commute last week and said, “Adam has a hilarious idea for an app you should totally make,” I was all ears. I created just that. Check out the demo video below, then I’ll show you how I created it in one night. For fun I tweeted this over to the Carolla crew and even tried to find a good e-mail, thinking if they wanted to use it to promote the network, they could have it. So far I haven’t heard anything, but I’m holding out some hope! As a freelance app developer, I’ve deployed multiple apps, updates, and fixes to the iOS and Android stores and I’m here to tell you: the process looks virtually brand new every. single. time. Forums and tutorial sites make a fortune trying to show developers the way as the targets move and the game constantly changes. Let alone the countless screen sizes and devices you need to support. How the hell is anyone supposed to keep up? Here’s how I survive: by using as little of their native technology as possible. Note: This app is just for fun (so far) and is not downloadable anywhere. I won’t be discussing actual app submission here. I love a well-defined product; that made this project a home run. Adam wanted an app you could basically just open and hear a sound effect. No problem. To make things interesting I would add a button the user could press to hear several “DUDE MAINTAIN” lines from the show. This would be a one-page app, so navigation, organization, and several other routine considerations went straight out the window. Perfect. Audio clips just needed to be cut out of the podcast, and I dreamed up sort of a DANGER sign visual design, figuring I could make use of plenty of the show’s own promotional graphics to fill things out. Simple as that. Although the audio was already out there, I did need to trim it down and get it organized. 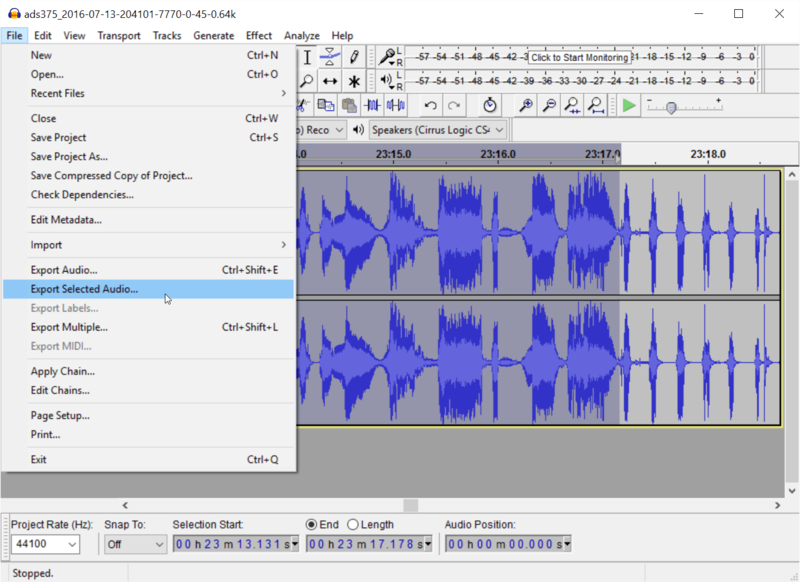 I downloaded the mp3 from the site, and exported each individual clip by getting good selections on them in Audacity, then using the Export Selected feature. A good example of an unforeseen project issue was that the podcast goes out as one mixed-down audio track (which I expected) but about half of the “DUDE MAINTAIN” lines were stepped on a bit by the other host’s laughter. Both Adams did this. If the podcast network was my real client, I’d ask for the individual audio tracks from the show to get clean sounds. Even though I was designing this app like a webpage, web design best practices can all go out the window. Text can be in an image instead of HTML, buttons can look like whatever you want, and any font you can imagine is fair game. Still, my needs were pretty simple. I created text images for the sign banner title and the button (and the button’s pressed state when it turns red). 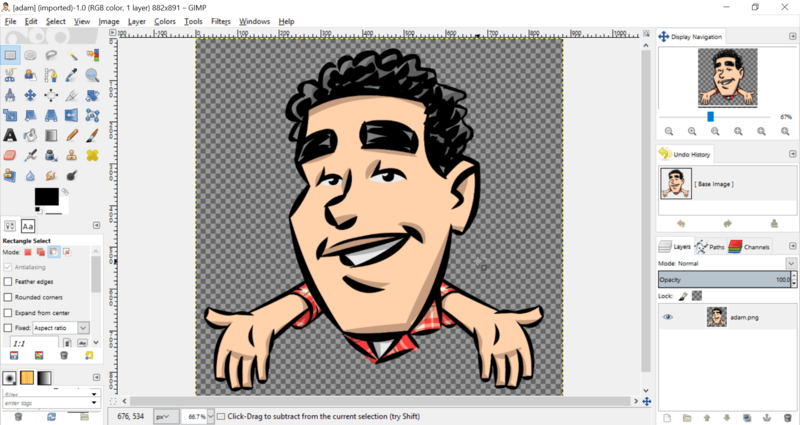 To include virtual Adam I used GIMP to cut him out of the Adam and Dr. Drew Show logo, rotated him to a fully vertical position, then actually had to cut out and mirror his right arm so he could have a left one. It was like cartoon surgery, and it was a complete success. One of the most painful roadblocks before the finish line was providing correctly-sized iOS app icons and launch screens in Xcode, which uses yet another brand new system and I’m sure almost no one is using their recommended method for creating them. I certainly didn’t. One of the most interesting things about this development technique is that one good, responsive design will fit virtually all screens the app will appear on. 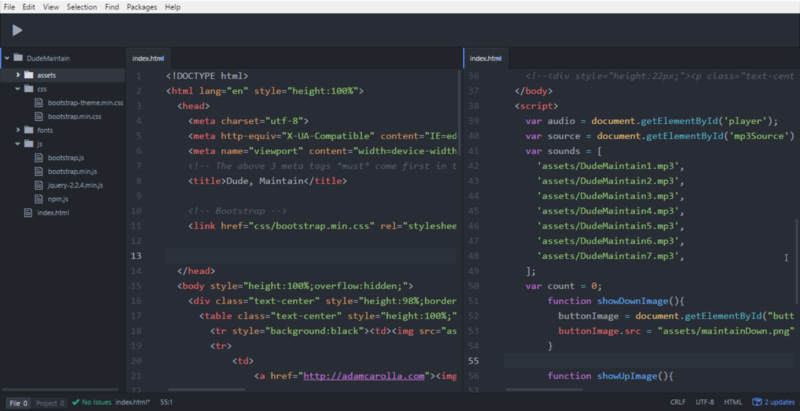 I created a pretty basic web page–actually I slapped in the Bootstrap template page–and filled in my very few design elements. Keeping everything center-aligned made for smooth sailing. The page is basically a big div with a large border, the inside is a three-row table: a row for the banner, a row for virtual Adam, and a row for the button. You can’t resize an app, but seeing it effortlessly resize in a web-browser during testing is a pleasure. Once you’re pleased with your page(s), turning a web page into an app is some kind of absolute magic done by Apache Cordova. I’m not going to try to explain the process better than their guide does. I’m just here to tell you that, once you do it, the resulting Xcode, Android, and other platform projects will load up and run without any trouble at all, which is really surprising every time. If you find yourself wanting to create an iPhone app and test it without being a paid member of their developer program, that is also now possible using this other guide. Suddenly, the app is finished and running on my phone. My son loves to play with it and it helps him to hear to “MAINTAIN” once in a while from someone other than me. If you’re also a fan or you enjoyed reading this, share it around. Maybe we can get some feedback from Ace himself! It’s not up for download at the moment. I’m looking at the possibility of putting the project on GitHub per a request on Reddit. I wouldn’t try to submit it without some kind of official word and I’m not really expecting that. GH would at least let some folks side load it or dig around the code if they like. I guess for updates on that you could either subscribe here via email or follow me @mechatodzilla.